So it's been a while! Which makes sense, given that the sad truth for any makeup hoarder is that it takes a very long time to go through a product completely. Today we once again we return to the world of foundation and primer for our used-up products. First up is the Rimmel Wake Me Up Foundation. A couple of years ago this was the drug store foundation that beauty bloggers and gurus were raving about due to the fact that it reportedly offered a glow-y, dew-y finish comparable to higher-end products but at a fraction of the price. What these reviews failed to mention was that the shade range is seriously prohibitive. Not only are there only 5 shades, but believe it or not, the bottle above is the lightest color they offer — 100, Ivory — and it still looks pumpkin orange. The darkest shade offered would just barely work for a white girl with a tan, and I can't quite see it serving even the Latin American marketplace, let alone African American women. But because I'm a ghost, my mistake was buying this in winter when my skin is at its all-time whitest, so I waited until Summer to start using it and I finished it up about a week ago. As always, I hate full foundation. So I mixed this product with both of the other items you see in the above photo and you can check back to the previous post on the Almay primer to see how I applied it. This was a nice foundation to work with. It mixed really well with both of the primers above, wasn't streaky at all and did give my skin a certain "glow" that I quite liked. Speaking of glow, I really liked the way that this covered my skin while making it look like I had nothing on. It didn't settle into pores or fine lines and the color was quite nice once I had a bit of a tan. I really liked this foundation — I liked the finish, I liked the way it made my skin look and I liked the price. But the shade range is a massive bummer. I hope that, given its success in the marketplace, they really expand the line. Next in line: The Hourglass Mineral Veil Primer. As you can probably tell, I got this as a sample from Sephora. A part of me is glad I didn't look at the price for the full product before I started using it, because I didn't want that knowledge to color my view, but I will say that I wish I hadn't liked this so much when the full size costs $60.00. It's really hard to describe the way that this product feels. There's almost something rough and dry about it — despite being a liquid. Which should be a negative, but somehow enables it to immediately sink into your skin. It's not greasy or gel-like or even similar to a foundation. It's gone as soon as you rub it in, leaving behind slightly more perfect skin. When applied alone, you can't really see any difference in the skin. But when combined with foundation, it turns the foundation into the perfect tinted moisturizer, adding just a hint of luminescence — but not in a way that leaves you "glow-y" or "sparkly." You skin just looks a little more... healthy and lively, if that makes sense. I do feel like this product extended the life of the foundation and by the end of the day when it came time to wipe my makeup off, I was sometimes surprised by how much product was actually on there. It gave me a really natural look all day without major fading and my 20x zoom mirror didn't really pick up the "look" of foundation anywhere (compared to when I would apply foundation alone, or foundation with a different primer). Unfortunately, this is the best primer I've ever used. And yes, I did wind up getting the full size. I'm full of shame. This was somewhat unpleasant to use. The formula is really thick and really goopy and didn't mix well with the foundation when applied to my hands. Once applied to the face and worked in with a brush, it was fine, but it definitely didn't feel quite as light and seamless as the Hourglass Primer. 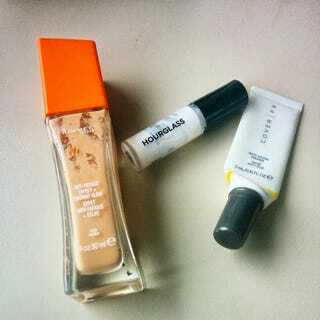 Both of these primers were perfectly good in terms of the way they looked on the skin when everything was said and done, but I did feel like my skin glowed more with Hourglass. Ironically, I think the Cover Fx gave me smoother skin than the Hourglass Primer, but it just wasn't as "nice" a finish for someone looking for a glow-y effect rather than a flat, matte one. I did feel like my foundation faded faster with this — not anything especially noticeable, but I could see more of my red patches coming through by the end of the day. It was hard for this to go up against the Hourglass Primer, and I think I would've been kinder to it if I wasn't alternating between this and a superior product, but overall this isn't something I'd necessarily repurchase as the price isn't anything spectacular (around $38) and I feel like I've used $10-$20 serums that have done basically the same thing. So there you have it — 3 products in 3 months isn't too bad. And before you say I didn't "really" use them up, this photo was taken about two weeks before I'd officially finished because I still wanted to give some idea of the look of the product in the container. They were definitely used up by the end. Let me know if you've been doing a Project Pan or a Spring Clean.